Sacroiliac pain standing is the most universal activity-related patient complaint. Long periods of standing can be difficult for SI joint pain sufferers, since the position increases stress directly on the sacroiliac and can exacerbate virtually any SI diagnosis. Since standing is necessary for so many life activities and responsibilities, patients can quickly find themselves in constant pain or greatly restricted in what they can accomplish day to day. Standing-related symptoms in the sacroiliac may help to positively diagnose the condition or at least narrow down the possibilities. This is great, since most diagnostic processes for SIJ disorders are highly subjective and often inconclusive. Every bit of help counts when it comes to achieving a verified diagnosis on the actual source of pain. 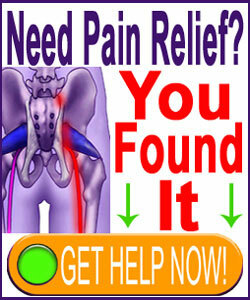 This dialog focuses on pain that is experienced in the sacroiliac joint while standing. We will provide an overview of the typical symptoms and why they occur. We will also provide some tips to help patients better manage their pain while they seek out curative care. 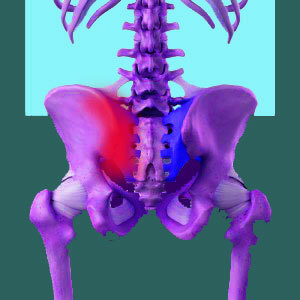 Standing-related sacroiliac pain is usually concentrated right in the region of the SI joint, where the pelvis joins the sacrum. The pain might feel like very deep and low hip pain or might radiate into the upper leg, buttocks, groin, perineum or lower back. Many patients tend to experience widespread symptomology that may encompass many of these regions as they continue standing. Pain might be bad all the time when maintaining a standing posture or might be worse during particular activities, like walking or climbing stairs. If patients tend to shift their weight from the painful side to the other side, they commonly develop discomfort and accelerated fatigue on the unaffected side, as well. Often, these are stress-related symptoms that become problematic over time from continual activity-avoidance to minimize pain on the side of the body suffering the SIJ disorder. Many patients, especially those with diagnoses of hypermobility, experience feelings of weakness in their leg, with many reporting perceptions that their leg might “give out” on them. Occasionally, this weakness leads to the leg actually becoming incapable of supporting the body weight and the patient might fall, increasing their chances of suffering additional injury. Standing is designed to distribute weight equally on both legs to balance the anatomy and minimize strain on either side of the body. However, when something is structurally-wrong with a supportive body part, standing might become painful or even impossible. The SI joint is wholly responsible for linking the legs to the spine. The joint must bear tremendous force during seemingly innocuous activity, such as standing upright and walking forward. Asking the joint to perform moderate tasks, such as running or climbing, exponentially increases the stress on the structure. Meanwhile, forcing it to perform complex tasks, like sporting activities, loads the joint far more noticeably. Standing is more than enough stress for a compromised SIJ to handle in some instances. The pressure of the ground into the body and from the body into the leg is huge and can spell real problems for patients with the full range of sacroiliac diagnoses, including dysfunction and sacroiliitis. Patients often experience hot-spots of symptomatic activity when transitioning from a seated position to a standing one and vice versa. They also typically suffer worse symptoms when standing for a long time without the ability to walk and change the position of the body, such as when waiting in line. Some patients lose the ability to stand completely and find themselves forced into a seated or reclining position until successful treatment can be rendered. These are the typical explanations for most cases of sacroiliac-related disability. It is very difficult not to stand at all and this extreme type of activity avoidance might do more harm than good anyway. Instead, try not to stand too long or under difficult circumstances. Do not push yourself to the limit standing, since symptoms might endure far longer than they might otherwise and there is a very real possibility that the stress could cause you to fall and get injured. Make sure to accommodate your physical requirements using alternative methods of exercise and activity so that you do not suffer additional complications of your reduced ability to stand. Talk to your physical therapist about exercises that can be done from more comfortable postures to keep up your strength and preserve your health while you pursue curative care for your painful SI joint. Instead, pick your moments to stand when you can try to build the strength of the “good” side of the body to help you manage when symptoms are particularly bad. More than anything, be certain to seek out qualified diagnosis and treatment from a specialist in sacroiliac disorders. Remember that SIJ diagnoses are difficult to achieve and many patients are mistakenly diagnosed. Therefore, you will need to seek more than one diagnostic opinion to improve your chances of achieving a correct verdict on both the cause of your pain and the best treatment path to resolve it.